Launching a new Christmas myth is always a dicey proposition, as there a number of notes you simply have to hit, while at the same time trying make your film feel fresh and current. Few films have succeeded as brilliantly as "Elf" and "A Christmas Story," and though "Arthur Christmas" isn’t quite in their class, it's still a very funny, sweet and entertaining addition to the genre. For the last few years Santa's oldest son, Steve (Hugh Laurie), has been doing all the heavy lifting around the North Pole, updating the IT, building a massive ship with a starscape underside and so on… While dad (Jim Broadbent) serves as little more than a do-nothing figurehead. For Steve, Christmas is a well-oiled machine honed to laser perfection to be executed with military precision. And watching his elves at work delivering presents is impressive—it's done with all the style, flair and expertise of a Bond film. Director Sara Smith, who co-wrote the film with Peter Baynahm, keeps the action fast and fun, and resists assaulting your senses with 3D flying objects. Steve's little brother, Arthur (James McAvoy), however, still believes dearly in the magic (spelled out with a glittery magic marker) of the holiday. But he is a bumbling klutz who got banished to the Letters Department after a minor disaster in another posting left countless elves homeless. But when it's learned that one little girl didn’t get her new bicycle. Santa's too sleepy, and Steve dismisses it as a rounding error. Only Arthur feels compelled to do whatever it takes to make the last Christmas wish come true. And so with the help of the cantankerous Grandsanta (Bill Nighy, who fires off all the film's best lines), Arthur hops aboard an old-fashioned wooden sled pulled by descendants of the eight original reindeer--powered by magic dust, of course. It will forever remain unclear why it is that, regardless of genre, the odd duck who still believes in magic/love/whatever has to be awkward, clumsy and dim, but there it is. And it seems odd that Steve would have developed such a massive operation and not have some sort of contingency plan in place in the event of a missed package. But it's the holidays, let's not nitpick. 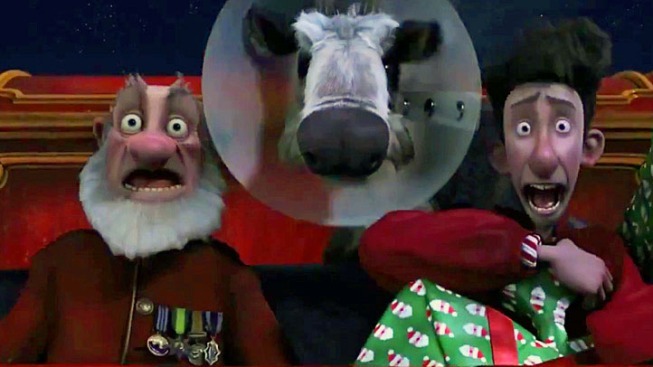 "Arthur Christmas" manages to walk the fine line between paying homage to the old ways, while recognizing the value of progress, and lovingly tweaks bean-counting bureaucrats in the process. And the laughs will play to all ages, without resorting to an exhausting barrage of pop culture winks—it's heartfelt without being sticky sweet.